When you walk through Kensington Market in Toronto, the last thing you would consider out of character is drawings on the street. 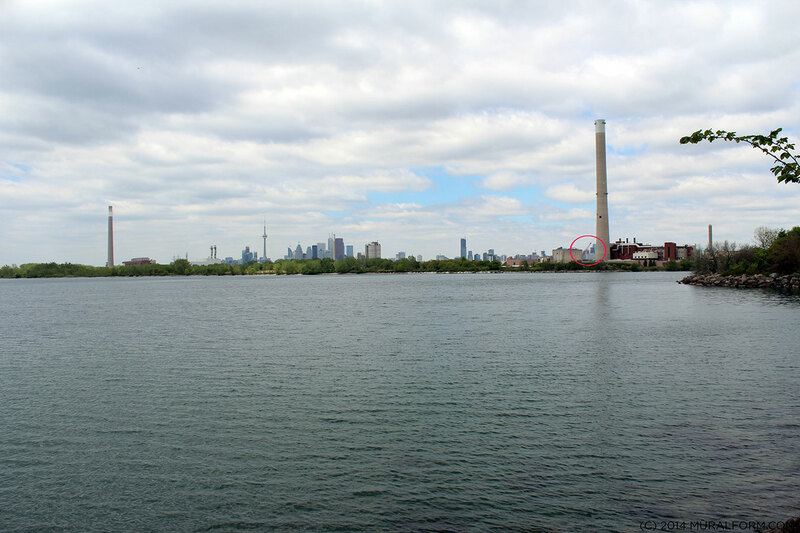 The longtime hub for vintage clothing, quirky bars, and hipster dining establishments, the area has built a reputation on being very different from the rest of Toronto. But this year, artist proposals for a road mural caused more than a disagreement, it turned into a fight at City Hall. Last year, Toronto’s city councilors considered banning road murals, citing that they “place considerable administrative, regulatory, and maintenance burdens on the city.” The decision was met with considerable opposition by local artists and community members, who say public art installations can beautify and bring people together. 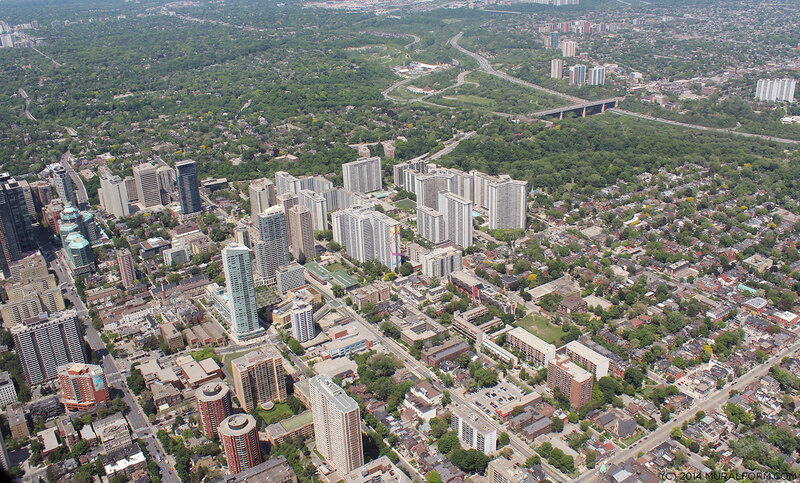 With the potential backlash from community leaders and residents in different parts of Toronto, the City decided instead to opt for a pilot program. From August to October of this year, they allowed street mural painting on specific streets in Kensington Market. The designs, materials, and the process would all have to be put through the project for review, but ultimately the program went ahead. With permission to move forward, the Kensington Market business association found artist Victor Fraser, who stenciled all the paintings for the mural. Community members were then invited to paint in the drawings. A special vinyl paint was used for all of the murals, which is supposed to last for six to nine months and withstand rain, snow, and more. The street murals have now all been completed as of October, 2016 and have each elevated the beauty and artistic wealth of the area, and indeed the city. The collaborative effort at every step, from the fight to have the murals to the design of the items to the interactive elements in their creation, the murals represent how a community can lobby, design, and create something that betters their neighbourhood. The pilot project may result in four more murals for the Kensington Market area but the idea is spreading to other areas of the city. Community activist Dave Meslin hopes these types of projects will be more common and widespread throughout Toronto. A group of Nunavut and Toronto teens have overcome a myriad of challenges to paint a beautiful mural in Toronto. The teens, part of the collective known as Cape Dorset, have put together Piliriqatigiingniq, “an unprecedented public artwork project” on Toronto’s Church Street. But getting this beautiful project off the ground has been a long and hard endeavour, one that demonstrates the skill and hard work that’s necessary in all stages of any street art project. The word “piliriqatigiingniq” is, according to the project’s website, is “a pillar of Inuit traditional knowledge, meaning to work together towards a common goal,” and fully displays the talents that young artists have in the lesser known areas of our country. 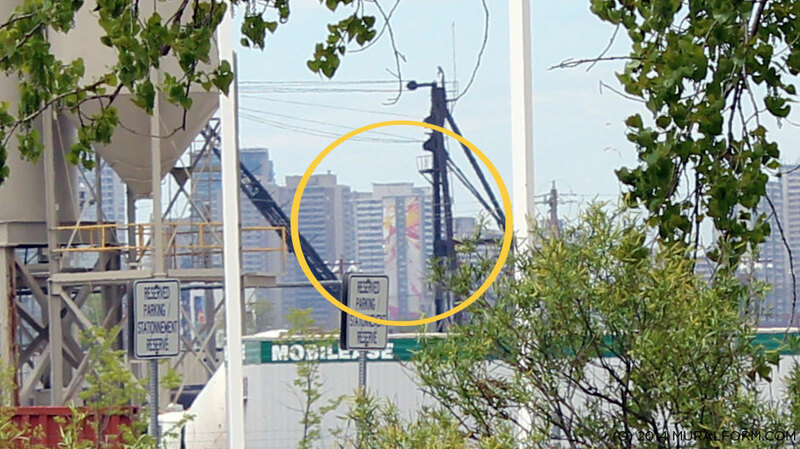 Overall, it took two years to get the mural up, and was made to show off the Inuit art style during this year’s PanAm and Para-PanAm games, which were a resounding success for the city and the country. 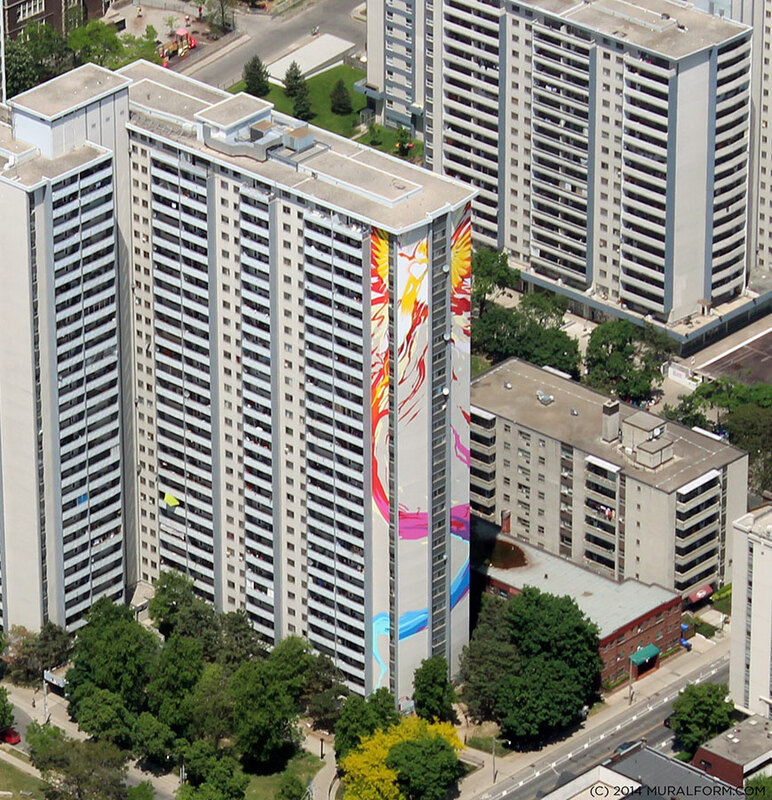 At over two storeys in size, the large mural had a hard time finding an appropriate place that could speak to the sheer depth of the project, and the creators thought they had the perfect place in a building on King Street East and Jarvis Street, but the landlord pulled out at the last minute with very little explanation. 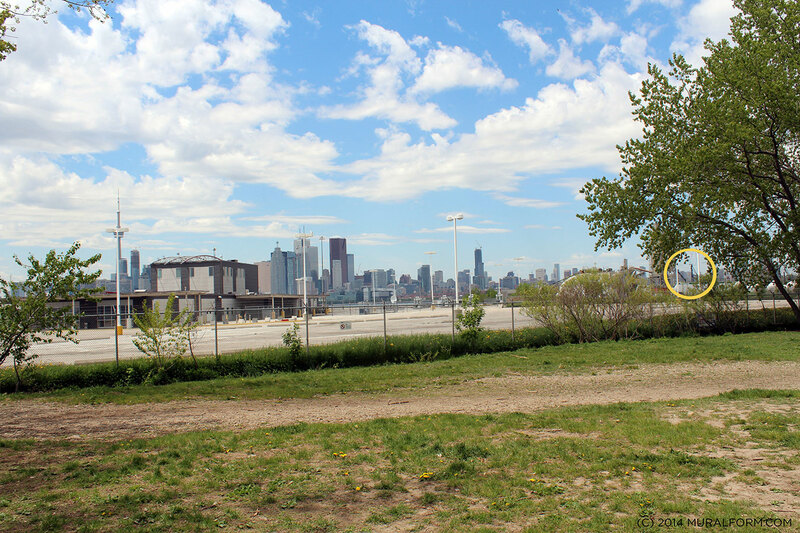 The sudden change created quite the scramble for a new space, and project directors Alexa Hatanaka and Patrick Thompson started making phone calls all around the city for a new location. “We ended up having to scramble for seven days,” Thompson says, “But we found one with two days to go.” Thompson also said that despite the last minute changes, the outpouring of support was “amazing” and the project ended up in an arguably better location. That location is a hostel only a block away at Church and Adelaide, which Thompson thinks is thematically appropriate. “It’s the perfect symbol for us,” Thompson said, “It’s a place where people come together from one place to experience a new place.” Both him and Hatanaka were hesitant to get too excited, however, after the last place fell through so quickly. But the newly donated space worked out and now Piliriqatigiingniq is completed and showing off the talent of Canada’s North. As for the mural itself, the beautiful and brightly-coloured design comes from teen Inuit artist Parr Etidloie. “I heard some stories about my grandfather carrying a snowmobile and they told me to draw it,” the artist told CBC News, “And it worked out.” Etidloie was joined by a local Toronto artist and three of his teenage friends, Audi Qinnuayuaq, Latch Akesuk, Cie Taqiasaq, to complete the project according to his vision, and the response has been overwhelming. Pedestrians and locals congratulated the teens on their hard work, but few of them truly knew the adversity these teens faced in making their project a reality. But now, thanks to the dedication of many people, and a sizeable grant, Toronto can proudly display some art from one of the country’s most isolated areas. For many people caught in traffic on Toronto’s notorious Don Valley Parkway, the Rainbow Tunnel is a welcome break. The tunnel’s entrance is painted in a bright rainbow pattern that’s been shining bright for over 40 years and has become one of the staples of the area. Many people have featured it in their photography and landscape painting, but one such painting just made someone millions of dollars. 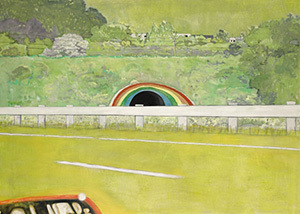 Scottish artist Peter Doig’s “Country-rock (wing-mirror)” is a landscape piece that prominently features the original mural. Doig’s work is usually landscape focused, but this one in particular was auctioned off to the highest bidder. Originally, it was thought the painting could reach $16 million. As for the original mural, it’s history has less money attached to it. 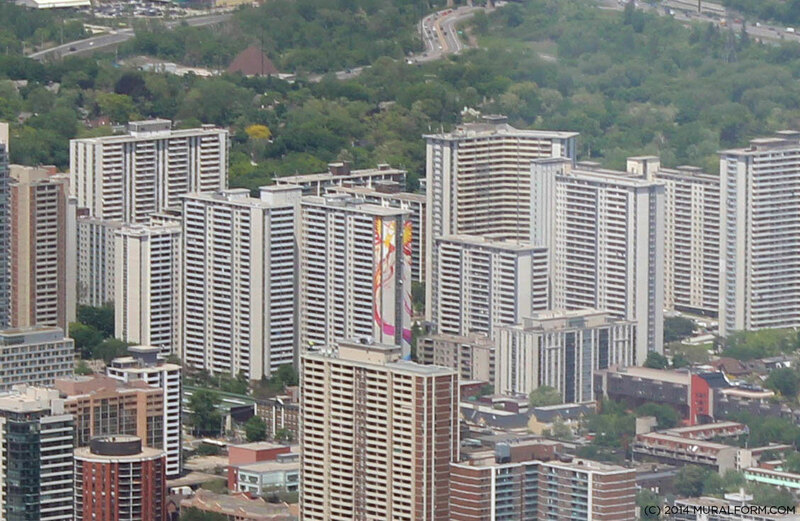 Commissioned in 1972, the mural is the work of Canadian muralist Berg Johnson. Johnson’s own relationship to the mural has a life of its own. He’s apparently been arrested multiple times for touching the mural up over its 40 year lifespan, but otherwise is a complete recluse. These rumours are debated and refuted by people, including his friends, but it all adds a certain history to the mural itself, something that probably attracted Doig to it for his painting, and probably influenced the eventual price of the painting at auction. What the painting shows is the value of public art and murals while arguing how people consume and privatize these public pieces. The original muralist was duly compensated for his work, but it’s nowhere near the sum art collectors are willing to pay for the painting that features Johnson’s public art. Johnson himself, still active in Toronto’s mural scene, is unlikely to see money from the piece that clearly uses his past efforts to increase its value, respectfully or exploitatively. Of course, public art is just that, public, and attempts to police its dissemination invites the very kinds of control that limit artists in general. But this also speaks to the role art still plays in the world. If Andy Warhol proved anything, it’s that the price of art, just like art itself, is highly subjective. After all, he painted replicas of one of the most common things in a grocery store, a soup can, and made millions of dollars and saw his art displayed around the world. Private art, the notion of being able to hide it away for a much smaller audience, is still worth more than something meant for everyone. And while some public art becomes private, like a recent Banksy piece on a house that was removed and sold at auction, the mural itself remains, at least monetarily, an art style unable to fetch the price of private art, even if its seen by many more people. 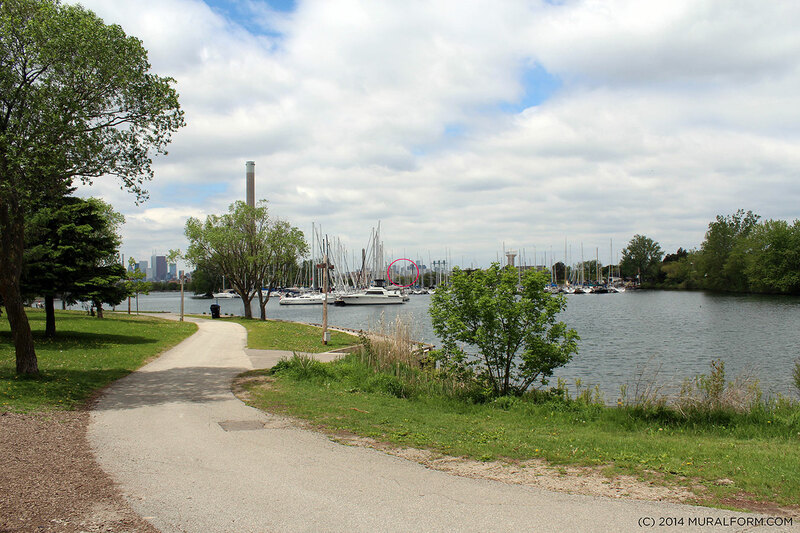 At the end of the day, however, Johnson’s mural is a widely loved and easily recognized part of Toronto’s landscape, a public art piece every muralist aspires to have in their portfolio. 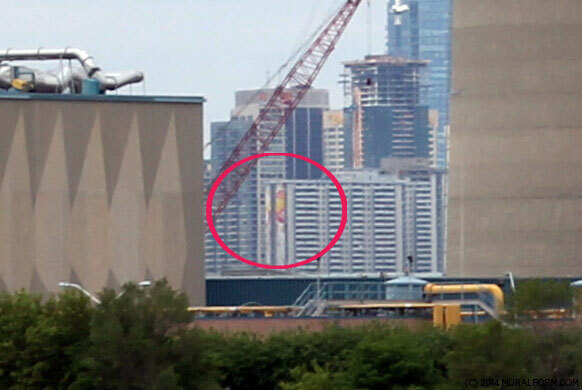 We just can’t get enough of the world’s tallest mural, located in our very own City of Toronto. We traveled across the city, snapping up shots wherever we could, in an effort to illustrate just how far away you can see this mural. Our photo shoot even took us to the Gardiner highway. However, this journey was not enough, and served only to whet our appetite. 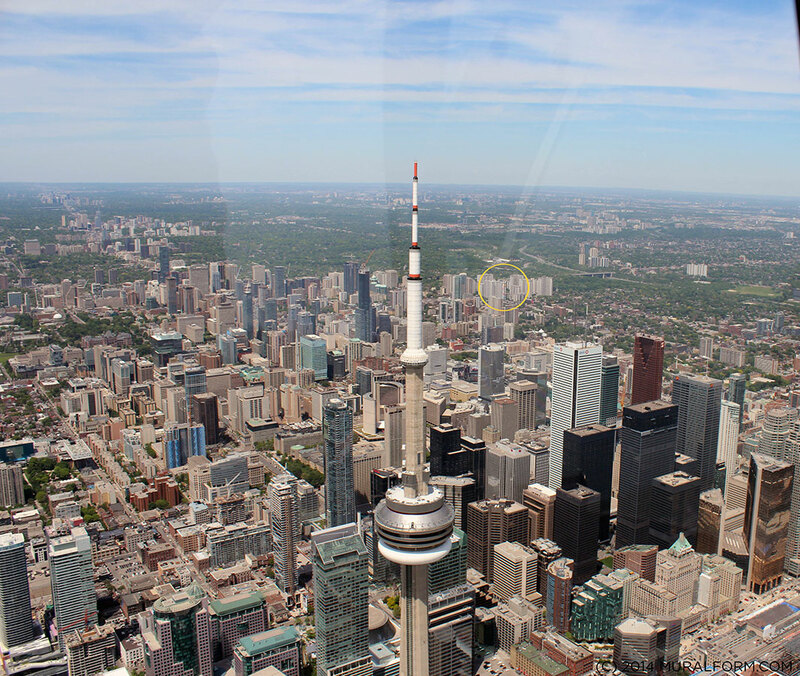 You see, we had a hunger that could only be satiated by taking to the skies, and so we did (with a little help from helitours.ca). What you see below is a composition of our adventure to capture the world’s tallest mural in it’s full glory. 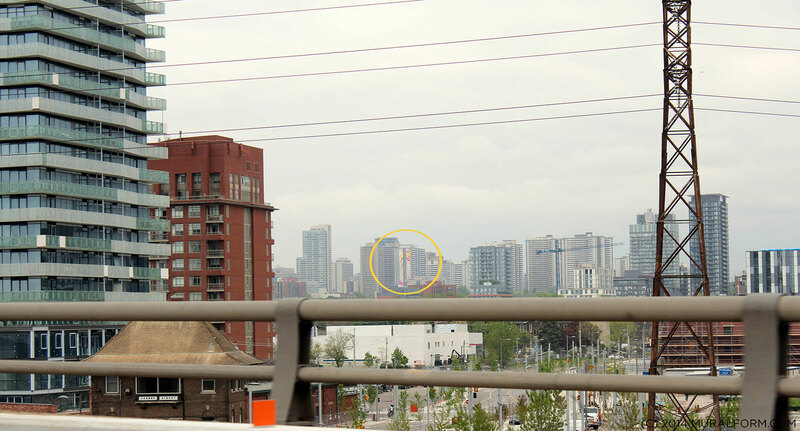 Below is each image from our original vantage point followed by a zoomed in version showcasing the mural. At the top of the page we’ve included a map detailing the locations and distance of our shots. 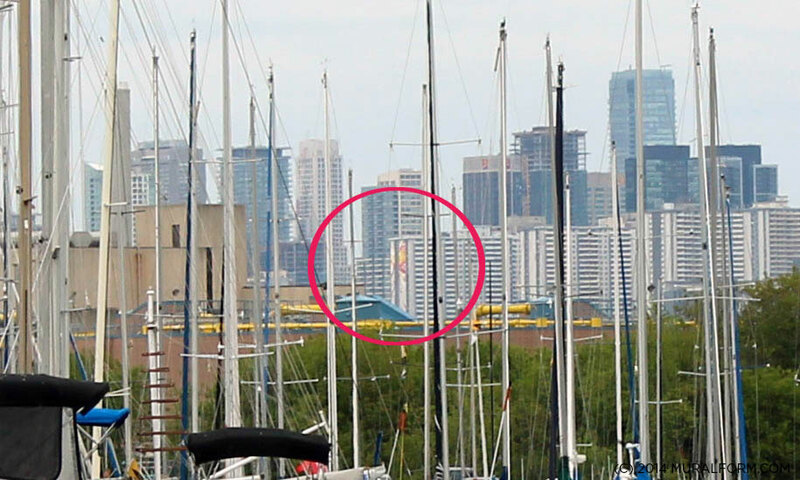 Not only can you get a good view of the mural but these are also some excellent scenic pictures of our great City of Toronto. Here at MuralForm, we like to talk about awesome street artists and cool projects, but we also love showing how street art can improve communities. Street art and murals can help cities develop tourism, document their history, or even celebrate their triumphs. 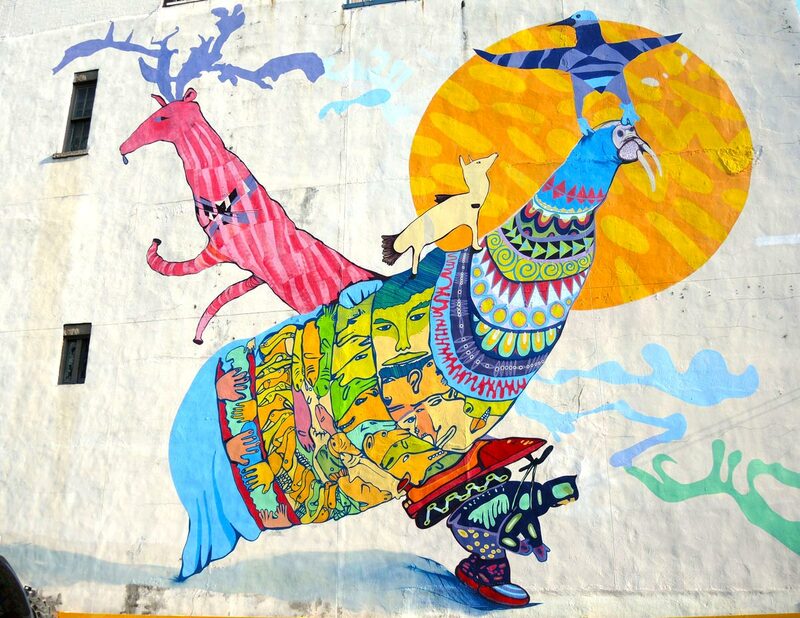 Murals can define a city’s aesthetic or even contribute to a national identity, as many saw in Brazil this year during the World Cup, and there are many organizations both local and international that try to encourage street art for these reasons. One such organization is Mural Routes, a not-for-profit organization based in Ontario dedicated to “the promotion of wall art as a public art form for the general benefit of communities and artists,” according to their website. The organization works with local and international agencies, volunteers, and artists to bring mural art to Ontario communities, predominantly Toronto, and to helping mural artists and enthusiasts to stay connected and mutually supportive. Mural Routes has been around for nearly 25 years, starting in the 1990s as an art project with the Scarborough Arts Council. By 1994, Mural Routes had expanded its scope and incorporated itself apart from the Arts Council while still working closely with them. Much of their artistic work results from collaboration with local businesses and governments. The recently unveiled “Eastern Gateway” mural, for example, is the combined efforts of the City of Toronto and Mural Routes. Located at 277 Old Kingston R. in Scarborough, the mural is a permanent piece designed to welcome people into the town. While designed by local artists, the project came together through the volunteer efforts of Scarborough youth interested in street art and making their town that much brighter. Mural Routes was also integral to the Warden Avenue Underpass mural. This piece documents the local history of the area while adding some colour to a usually ignored part of a city. Once again a collaboration of the City of Toronto and Mural Routes, the piece was praised by city councilwoman Michelle Berardinetti. While Mural Routes is interested in getting murals onto walls, their major focus is connecting and educating the public and artists on the benefits and opportunities tied to murals. The organization regularly hosts networking events and professional development workshops, embracing the business end of street art while promoting its benefits to Canadians. Much of the information shared and exchanged at Mural Routes various meetings was compiled into Mural Production: A Resource Handbook for artists and business owners. Mural Routes continues to bring artists, businesses, and the public together by promoting the many benefits of street art, whether its through community meetings or murals made with community involvement. The program is great for aspiring artists, community members, and business owners together and it is this multifaceted approach that lets Mural Routes stand apart from other muralist organizations. For more information, be sure to visit their website.